A few years back, a subplot was introduced on Arrow, which revealed that, unbeknownst to him, Oliver Queen had a child all along. In the time since, he’s learned of William’s existence but has decided to stay out of his life, due largely in part to the dangerous nature of the titular hero’s crusade. Not surprisingly, the young lad has been kidnapped twice, first by Damien Darhk and, more recently, by Adrian Chase/Prometheus. As luck would have it for William, he didn’t have to find out who his father is via one of Maury Povich’s shocking paternity tests, but rather, by the violent finish to Chase’s endgame that saw Lian Yu explode, likely taking a few cast members with it. 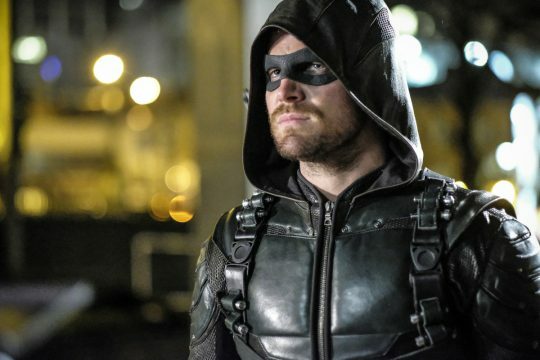 Right now, we’re not entirely sure who made it out alive, but seeing as how Juliana Harkavy, Rick Gonzalez and Katie Cassidy have all been confirmed as series regulars and will be reprising their roles as Black Canary, Wild Dog and Black Siren, respectively, it’s probably safe to assume they’re all among the living. Likewise, the same could be said for Emily Bett Rickards’ Felicity Smoak given that it’s been hinted the Helix storyline is far from over. That actually lines up with Amell’s previous statement that season 6 will be about family, and should bring a new measure of depth to the show. Actually, when the idea of Oliver having a child was first introduced, many of us assumed that he’d be Connor Hawke, but Legends of Tomorrow shot that down by showing John Diggle Jr. adopts that name in the future, thus taking up the mantle of Green Arrow. Still, we’re not ready to rule out the possibility of another archer in training. Arrow returns for its sixth season on Thursday, October 12 on The CW. Will you be tuning in? Let us know in the usual place.